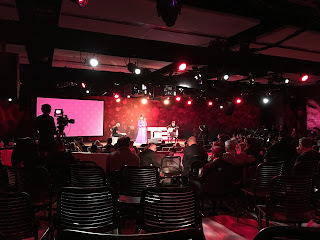 This would have been my 9th TEDActive conference, but TED decided to not hold that sister conference this year. 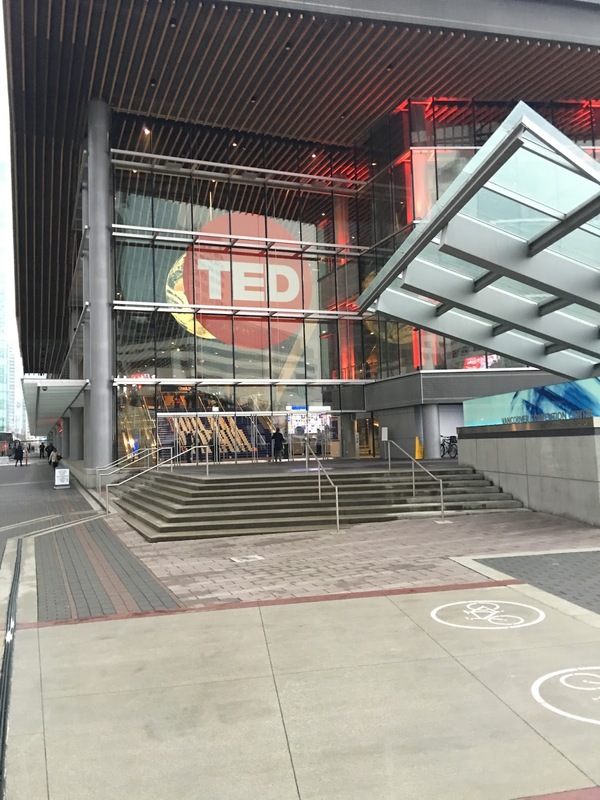 Fortunately, I was able instead to get into the regular TED conference in Vancouver. I had long wished to attend the “real” TED conference rather than the TED Active simulcast, but over the years had come to like the people and atmosphere of TED Active. 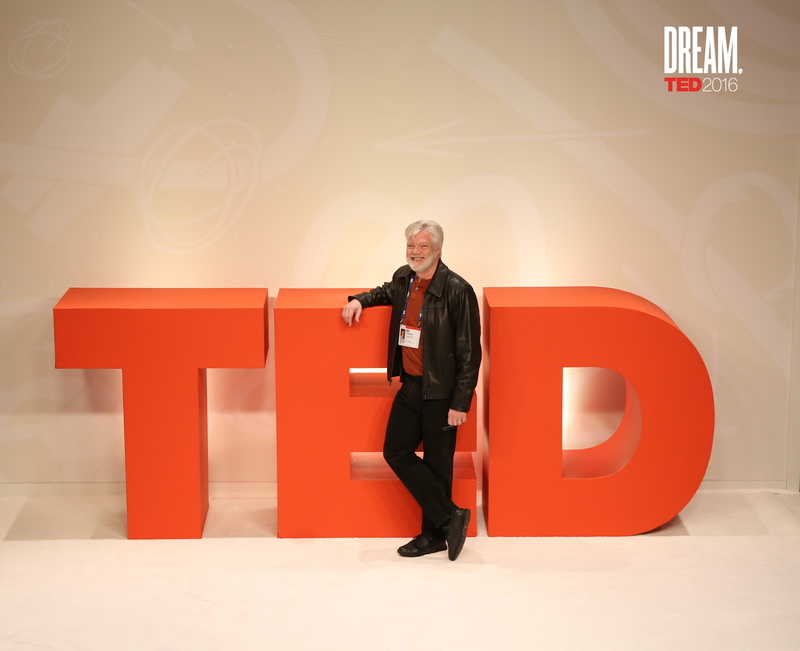 I had even decided that I would not attend the main TED conference except as a speaker. Obviously, that hasn’t happened, but I’m still holding out judgement on whether I will attend future TED conferences until I see how the week goes. I come here every year primarily to have the TED talks force me to think. I'm looking forward to seeing what will end up being my big takeaway from the the week. Most years I end up deciding to make a change in either my life or my company or both. I do my best to attend all of the talks and even force myself to talk with some of the many interesting attendees. While TED has a much more impressive (and larger) attendee list than TED Active, I’m guessing that I won’t be hanging out with Al Gore, Bill Gates, Sergei Brin, or Jeff Bezos. Mark is here as well, though he arrived on Saturday while I did not arrive until late on Sunday. It is always good to have someone to hang out with. I expect we will also spend time talking about our company as well as theTED talks themselves. Before the sessions began I registered and got to see what was in my swag bag. The bag itself was a canvas one from Lands’ End. While it was a nice bag that I'm sure I'll end up using, it was nothing special. The contents, however, seemed to be a real upgrade from previous years. 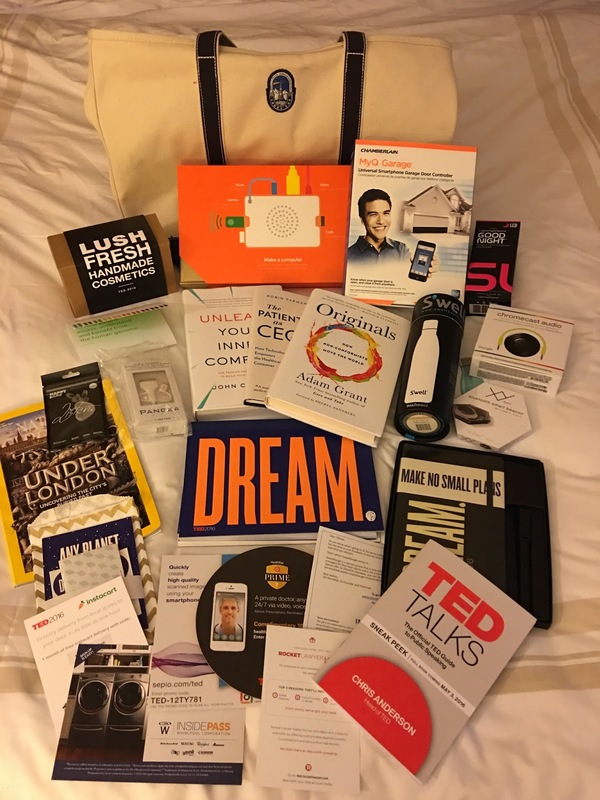 I don’t know if that is because the goodies are better at TED than TED Active or this is just a better year. The bag itself contained the usual water bottle and a number of things to sign up for like HealthTap and Rocket Lawyer. I usually don’t have the time to check these out, but some of them sound interesting. There were also a number of gadgets that I’m looking forward to playing with like the Google ChromeCast Audio (a device for streaming audio over WiFi directly to speakers) and the XY Find It (a small device to attach to things you lose). In addition, I had to make some swag decisions. In the group of gifts redeemable online, I chose 23andMe. I already use the DNA testing service, but I plan to let my wife try it as well. For the tech gift, I went with the Chamberlain MyQ Garage, a WiFi garage door opener. I admittedly have another brand of these at home that I need to install, but I do have two garage doors! For the kids’ gift, I was disappointed that they were out of the Radio Flyer Tesla electric car for kids, but instead I got a Kano Computer Kit that I think my grandsons will enjoy making with me. Finally, I picked three books. Fortunately, I can send this all home via UPS as it weighs a ton! The first pair of sessions were short talks from the TED Fellows. The picture gives an idea of the setting for these talks which is a different theater from the main stage and only holds a few hundred people rather than the over 1,000 in the main venue. Most of the talks were interesting and engaging, but two stood out for me. One was the Muslim comedian, Negin Farsad. She managed to be rather funny while pointing out the ways Muslims are treated (and mistreated) in America. One example of her humor was a video of her asking people in NYC whether they rather would eat bacon to prove they should not be put on a list of Muslims. It was rather funny, absurd, and thought provoking. I'm hoping to have an opportunity to chat with her during the week. The talk by Mitchell Jackson was the best one of the two sessions. He challenged the concepts of "Whiteness" and "Blackness." What he said dovetailed well with a book I'm currently reading by Ta-Nehisi Coates, Between the World and Me. I came away more convince than ever that race is a concept that needs to go away. I resolved to do my best to stop using it. I also need to spend some time studying whether the concept is present in the Bible or not. A quick examination shows that the word race shows up in English translations, but the Hebrew and Greek words are rather different. It's always good to find things to consume my spare time! The first and only real session of the day was a series of very well crafted talks that left me somewhat disappointed. It started off with a 10-year-old girl from India, Ishita Katyal, sharing her concerns and hopes for the future. Astro Teller of Google X told about their "Moonshot Factory" and the many cool things they are working on like autonomous cars and balloon-based Internet service. The things he talked about were all ones that have been in the press, but the talk was fun. Shonda Rhimes, a self-proclaimed titan of television with shows like Grey's Anatomy, gave a talk about finding balance through play with her children. The talk was well written and felt like a performance rather than something from the heart. When the teleprompter failed (normally, TED does not allow their use, but I guess she is important enough), it only emphasized the performance nature of what she said. I'm sure they will edit that out when the talk goes live and folks will think it was amazing. Dan Pallotta attempted to conflate the Apollo program and the Stonewall protests to some how convince us to strive for more compassion (or something) in our lives. He started out strong, but lost me along the way. Bill T. Jones did a dance performance that I think was about mortality (he turned 64 years old that day and someone close to him died at 92 the day before. His performance left me impressed with his ability at that age, but also did not move me. AR Rahman's performance of Indian music was enjoyable, but nothing more. The best talk was Riccardo Sabatini's about genetics. He went over facts I largely knew, but did so in a very visual way. He had people wheel in 5 carts of large books. Each of the almost 200 books (272,000 pages) was filled with the letters C, A, T, and G which was the full genetic code of the geneticist, Craig Venter. He then opened a book and read the few letters that determined his eye color. He then showed how a team of researchers had used machine learning to reconstruct a face from someone's genetic code. The results were not perfect, but were impressive. Obviously, they will only improve over the time. He used all of this to point out the importance of making decisions about what we should do with such technology before it was too late. The talk was well done and very thought provoking. At the evening party, the food was very trendy and confusing (I have no idea what vegan scallops could be). I settled for a few shrimp and desserts before heading back to my room exhausted. Another typical day at TED.